Former Sonics sprinter, Kimberlyn Duncan, took the Women’s 200 meter title at the U.S. Championships defeating reigning Olympic gold medalist, Allyson Felix, in the process. Duncan’s winning time was a wind-aided 21.80 and a personal best. This performance secures her spot on the U.S. National team for the upcoming World Championships to be held Aug. 10-18 in Moscow. Former Sonic, Kimberlyn Duncan, defended her NCAA Division I title in the women’s 200 meter dash with an extraordinary time of 22.04. This latest title caps her remarkable collegiate career with the LSU Tigers. Ex-Sonic athlete, Kimberlyn Duncan, is once again a nominee for a prestigious collegiate award. This time it is Sports Illustrated’s College Athlete of the Year. As fans we can visit the site and cast our votes for Kim against some heady competition. Go Kim! 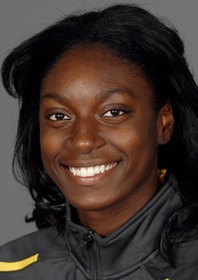 Former Sonic and LSU star, Kimberlyn Duncan, won the University/College Women’s division of the 100 meter dash at the annual Texas Relays in Austin, TX. Duncan, a 200-meter specialist, recorded a blistering time of 11.06 seconds (wind-aided 2.8 m/s). You can watch the race here. Former Sonics athlete, Kimberlyn Duncan, has been nominated as one of three female finalists for the prestigious Bowerman Award given annually to the top male and female collegiate track and field athletes. You can watch the awards show live today, Wednesday, December 19 at 5:30 PM Central Time on Flotrack. UPDATE: Kim Duncan wins the Bowerman! Watch her acceptance speech. Former Sonics and Cypress Springs High School athlete, Kimberlyn Duncan, has qualified for the Women’s 200 meter final at the US Olympic Trials in Eugene, OR. Duncan is currently a 5-time All-American on the LSU Tigers track team. The finals is set for Saturday at 6:50 PM Pacific time. UPDATE: Kimberlyn Duncan narrowly missed qualifying for the team by finishing in 4th place in the 200 meter dash final. Also, another former Sonics athlete, Grecia Bolton, member of the University of Houston Cougars track team, competed in the trials in the Women’s 100 meter dash, but failed to advance out of the preliminary round.